The Kool-Kit when combined with the Blanketrol® III is a whole body cooling system for induced hypothermia and other patient temperature applications for both neonates and adults. The Kool-Kit provides caregivers ready access to their patients, and helps administer temperature management and controlled re-warming for each patient. This method of cooling allows for early treatment that is fast, cost-effective and dependable. 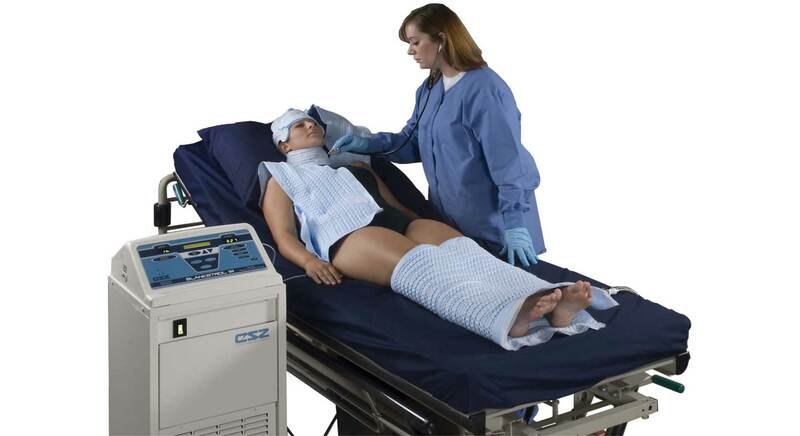 It contains three high quality cooling blankets and wraps, the heap wrap, vest and lower body blanket. The self sealing hoses keep water from spilling when disconnecting the blankets. The random flow design of the blankets/wraps ensures that the therapy will be constantly delivered regardless of the patient’s positioning. This high quantity, high quality coverage is not matched by any other and allows for therapy to be provided to all of the major vasculature. EASY – The Kool-Kit incorporates Velcro® on the Head Wrap and Patient Vest, with no adhesive or cumbersome wrapping required, making application fast and easy. VERSATILE – Each piece is fully adjustable, allowing for easy access to skin, IV lines, EKG pads as well as other monitoring devices and can be used on most patients. EFFECTIVE – With approximately 66% body surface coverage, the Kool-Kit offers increased temperature transfer due to its unique design.